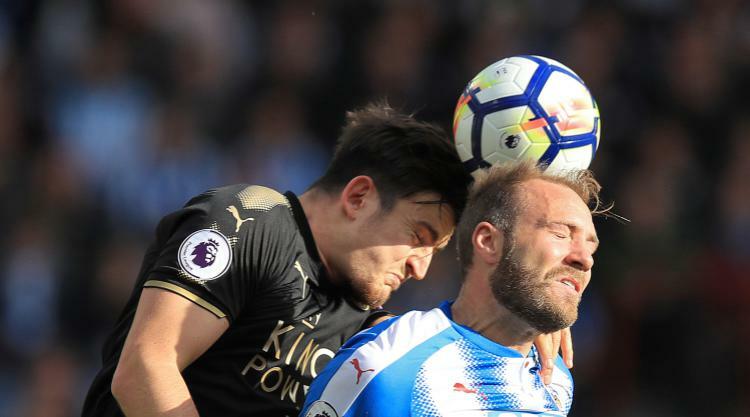 Huddersfield striker Laurent Depoitre said his Premier League dream had been realised after scoring on his full debut in the 1-1 draw against Leicester. The big Belgian, a £3.5million summer signing from Porto, marked his first league start for the Terriers with the opening goal 40 seconds into the second half. Jamie Vardy's penalty four minutes later rescued Leicester a point and although Huddersfield forward Elias Kachunga's second-half header was incorrectly ruled out for offside, Depoitre's first taste of the English top flight had met his expectation. "The atmosphere in the Premier League is great, you can really feel it," he said after the game, watched by 24,129 at the John Smith's Stadium. "I have always dreamt of playing in the Premier League and it was everything I hoped it would be." Depoitre helped lead from the front as the Terriers dominated the first half without seriously testing Leicester goalkeeper Kasper Schmeichel. But less than a minute after the restart Depoitre bustled on to fellow debutant Abdelhamid Sabiri's through ball and outmuscled Foxes centre-half Harry Maguire to fire home into the bottom corner. "I'm very happy to score. It was a good ball through and I just had to concentrate on being faster than Maguire and make sure I got the shot off across the keeper," he said. Town have registered eight points from five games and Depoitre is convinced they can avoid an instant return to the Sky Bet Championship. "I don't know how far we can go as a team," he added. "We have good players and a good coach and you have seen from the first game that we can cause a lot of Premier League teams problems. I definitely think we can stay in the league." Had Kachunga's 61st-minute header not been ruled out for offside - television replays confirmed he was clearly onside - the Terriers would have bounced back from last week's first defeat of the season at West Ham with another three points. Foxes winger Marc Albrighton conceded his side had turned in a below-par performance. "We have to be happy with a point," he said. "We didn't have the energy we normally have and against most teams in this division you won't get away with it. "Huddersfield did to us what we normally do to teams. It's great if you can pick up points against the so-called big sides, but we need to concentrate on beating teams around us. "No disrespect to Huddersfield, they're a fantastic side, but we need to come to these sides looking for maximum points." Foxes boss Craig Shakespeare admitted he was also grateful to have avoided defeat and added there had been no further developments in the club's bid to complete the Â£22million signing of Sporting Lisbon midfielder Adrien Silva. Leicester are in the process of appealing after FIFA refused the player's registration as they did not receive the paperwork in time, with the Foxes missing the deadline by 14 seconds.